Our credo is "Insuring Relationships". What does this mean? It goes well beyond the traditional role of being an Insurance Broker. In depth analysis of your business as it relates to risk and the cost of the risk. Using both traditional (insurance products) and non-traditional products (self insurance, large deductibles, captives, etc...) to best satisfy your needs. Educating, assisting and directing you in the use of these techniques. Being an advocate for you with Insurance Companies on cost, coverage and claims. Bringing substantial professional resources to you in the form of legal, accounting, banking and human resources. Being persistent on your behalf, because there is no substitute for persistence. The Leavitt Group is an organization of affiliated independent insurance agencies with over 115 locations across the United States, approximately $1.5 billion in annualized premiums and $198 million in consolidated revenue at year-end 2008. (Learn more about The Leavitt Group) This size gives us the purchasing power for the benefit of our clients. By bringing these services to you we will "Insure Our Relationship". Cash, Sullivan & Cross achieved its goal of becoming the No. 1 Insurance Broker for Ranking Arizona 2004 (for 2002 & 2003 the firm ranked second). This is a remarkable accomplishment for its staff consisting of just four dedicated people. The next smallest broker ranking in the top 10 has more than 20 employees. How did Barbara Constance, Karen Spencer, Richard Webb and Bill Cross accomplish this? Simply answered: by servicing its clients. 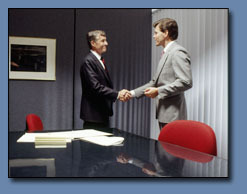 They are advisors and advocates for their clients regarding claims, costs and coverages. They are persistent on their clients behalf to make certain they do the simple things that let their clients conduct their business without getting bogged down with "Insurance Red Tape." The world of insurance can be confusing and difficult. Cash, Sullivan & Cross takes pride in knowing that its clients will have certificates of insurance and auto ID cards within 24 hours, and that all phone calls will be answered the same day. The firm keeps in touch with its clients, reviews their insurance contracts, assists them with difficult claims, publishes a timely/informative newsletter and periodically sends copies of pertinent insurance articles to keep them informed about current insurace issues. In 2003, clients showed their appreciation with a 100 percent renewal retention rate and their vote of confidence through Ranking Arizona. © 2008, Cash, Sullivan and Cross. All rights reserved.